Manchester City's Champions League opponents Schalke earn a goalless draw with Freiburg despite playing with 10 men for 48 minutes. 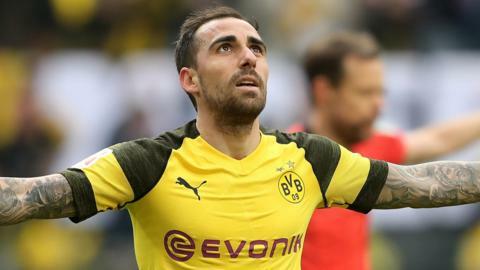 Paco Alcacer continues his incredible scoring run as Borussia Dortmund maintain their unbeaten start to the Bundesliga season by beating Freiburg. Leicester City reach an agreement with Freiburg to sign Turkey defender Caglar Soyuncu and sign Filip Benkovic for a reported £13m fee. Is this the most bizarre use of VAR so far? Referee Guido Winkmann recalls the Mainz and Freiburg players from their dressing rooms at half-time to award a penalty given by VAR. Read more on Is this the most bizarre use of VAR so far?